This year marks the 40th anniversary of the founding of the Go World Brass Band in Europe. 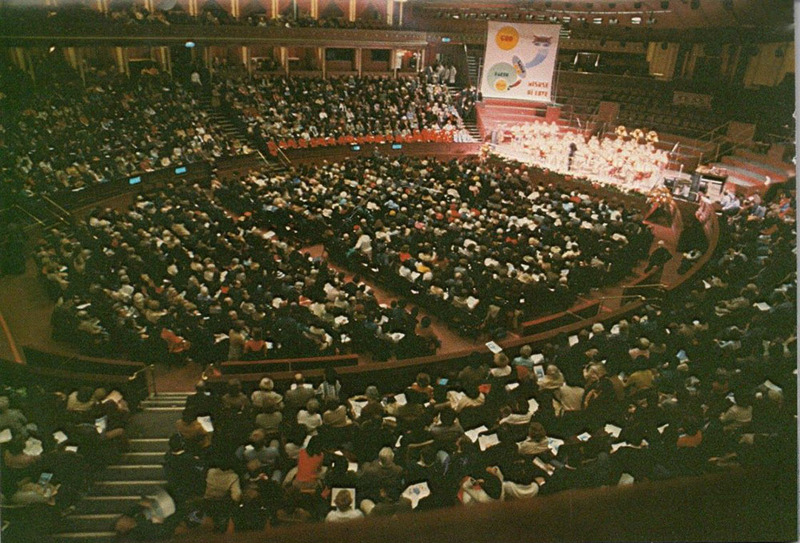 It has gone quite unnoticed but in 1978 when True Father was in Britain and started the homechurch providence, he also founded the European Go World Brass Band. The Go World Brass Band had been in existence in America and supported major rallies such as the Washington Monument Rally. About 20 or so American band members were brought to England in 1978, and many European members were recruited or, as in my case, auditioned and joined the GWBB team. Father's vision was that every band member plays three instruments. Back then, all church leaders were asked to learn to play an instrument as well. Instruments were bought for the (then) for me astronomical sum of around 50.000,- Pound Sterling. I was a young man then of a mere 22 years and all my hopes and dreams to be a musician came true when we were each given instruments. We all went out to Cleeve House, where we were given the instruments. At first, I was given a clarinet, and we immediately embarked to learn an unknown instrument. Up until then I had only played the guitar. It felt like a matching. You should have heard the noise when someone was practicing a different instrument in each corner. Out on the lawn the drummers were marching to the beat of their drums. Then nine band teams were formed. Some bass players were missing, so I switched from clarinet to sousaphone which is a form of a bass tuba. It felt alright with me, since my grandfather had been a tuba player. Also, True Father visited Cleeve House and listened to our early band efforts. We were given the mission to support the homechurch mission and their events. Father even asked us to become so good that we could perform in Las Vegas. During the 1978 Blessing in London, us who weren’t matched yet, stayed in the Irish countryside at Kilmurry House. For three weeks, I did nothing but playing the tuba alone in the Irish countryside. That’s when I learned to play basic tuba. We also paraded with our colorful uniforms throughout the country in big parades inviting to the Royal Albert Hall Rally, which was held on November 7th, 1978. I felt so proud of having performed at the prestigious Royal Albert Hall. The most important advice True Father gave to us was that in every audience there is someone who is happy, someone who is sad, someone who is angry and someone who is joyful. So we should play a happy tune, a sad tune, an angry tune and a joyful tune and really feel it. So everybody in the audience will feel understood, and we can unite them. To this very day, I pass on this advice to all musicians I meet when we talk a bit deeper. But we were young then, unmarried, not much life experience. We mostly played nice “churchy” songs. We didn't even know how to play an “angry” song. Was that even allowed in our movement? So lacking life experience also our music lacked that authenticity and gut level feeling that worldly rock bands had. I learned it the hard way: You can have nice words, nice chords, nice singing but no spirit. If you are nervous you can hear it in the tone that comes out of your flute, voice, etc. Similarly to a marriage, once you start expressing you cannot hide and—most importantly—you cannot fake spirit! You are who you are, nothing less nothing more. And performing you cannot rehearse, you learn it through performing. Band life wasn’t easy. Even though True Father spoke to us directly several times, the band faced many misunderstandings within the movement. Just like in society, those who do the “real work” don’t understand creative people and vice versa. The same thing was and still is happening within our movement. Which non-musician can understand the amount of work that goes into making music? So when you weren’t fundraising or witnessing you were considered “having an easy time.” Later we did extensive charity work, but the money came from fundraising. So all these years some of us have continued to make music to this very day. 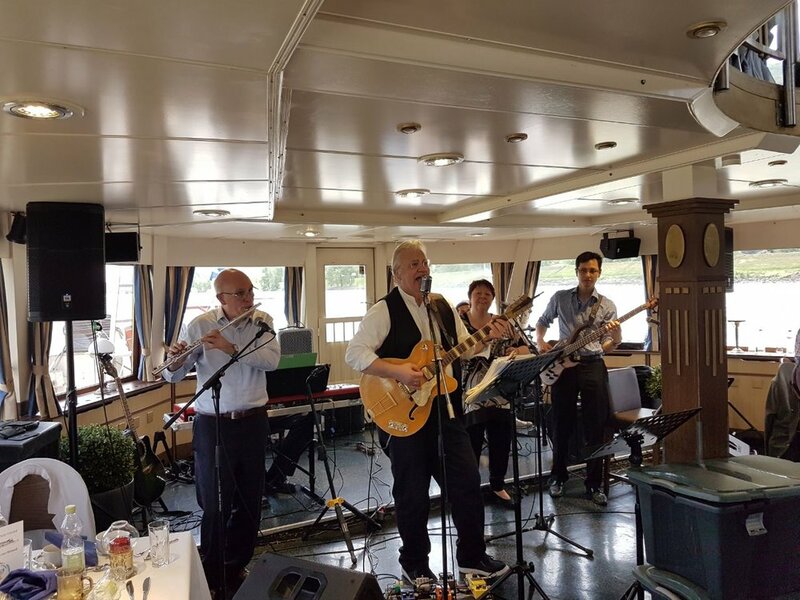 This year several GWBB alumni gathered and literally “rocked the boat“ on the Danube river cruise in Vienna on the occasion of True Mother's visit or at the Pentecost festival at the Neumuehle in Germany. There we mentioned our 40 year anniversary. Coincidentally (coincidence is God's pseudonym if he doesn't want to sign directly) two GWBB Alumni (Ulrich Ganz and I) were invited by the Hamburg Scientology church to attend their annual meeting south of London. So we extended our stay three more days as a pilgrimage to our places of activity 40 years ago and met up with GWBB and IOWC veterans. We visited Trafalgar Square where we held several large band rallies where even True Parents were watching. I want to request all Unification musicians to keep the candle burning and to keep the dream alive. Back then, we would have loved to plug into the experience of seasoned musicians, but we were all of somewhat the same age, and hadn't been through the mincer of the daily grind yet. But now I invite any young musicians to plug into our 40 years of performing experience. So feel free to contact me. Click here to listen to True Father’s founding speech of the Go World Brass Band.